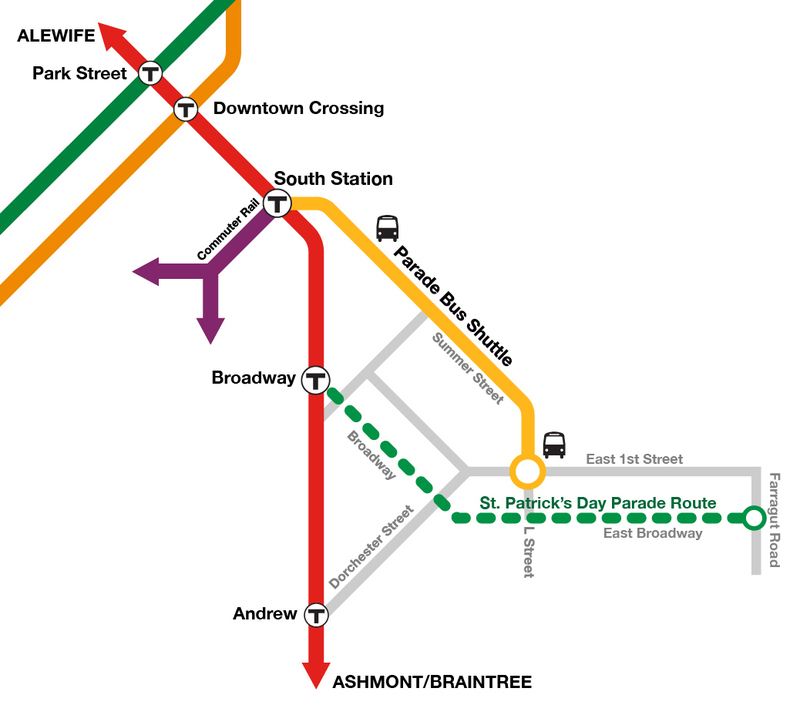 Subway: The MBTA encourages customers traveling to the St. Patrick’s Day Parade on Sunday, March 18 to board any Red Line train to South, Broadway, or Andrew Stations. In the interest of public safety, Red Line trains may bypass Broadway, as this station may not be suitable to drop off customers at certain times throughout the day due to heavy crowds. Customers should allow ample commuting time and develop an alternate parade-viewing site other than the area near Broadway. Special Shuttle: From 10:30 AM to 6 PM on March 18, special bus shuttle service will also be provided to and from the Summer Street-side of South Station to Summer Street at East 1st Street in South Boston to accommodate passengers traveling to the parade. Bus: Beginning at approximately 9:45 AM on March 18, all bus routes that normally service Broadway or Andrew Stations will be unable to do so due to traffic and road closures, though the stations will remain open for Red Line subway service. Additionally, Bus Routes 9, 10, 11, and 47 will be detoured around the parade area. Commuter Rail: Keolis will operate Commuter Rail trains with extra seating capacity to accommodate passengers attending the parade. Safety: Transit Police and additional customer service personnel will be available in stations and on-board trains throughout the day. Parade spectators are asked to leave backpacks and water bottles at home.